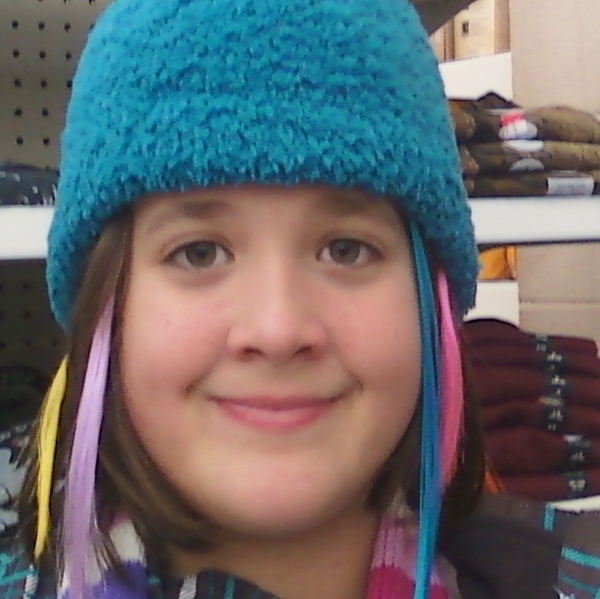 Rach trying on hats at Walmart. This last year through a total God thing (Essie made friends with a piano teacher’s daughter who also had a son just a little younger than Issac) Rachel started taking lessons. Chris, the piano teacher, charges less than the other teachers in the area and is lovely and laid back– which makes her a perfect match for Rachel. The downside was that due to our current financial position (living on what God provides instead of a regular paycheck) we still couldn’t afford the lessons. So she had to stop but that hasn’t stopped her from practicing what her teacher had taught her, getting a full size keyboard with pedal (another gift from God) so she can play right and going each Friday to practice on a real piano at my mother-in-law’s church. Plus, occasionally her teacher would ask her to come babysit during lessons and give her a lesson as well. 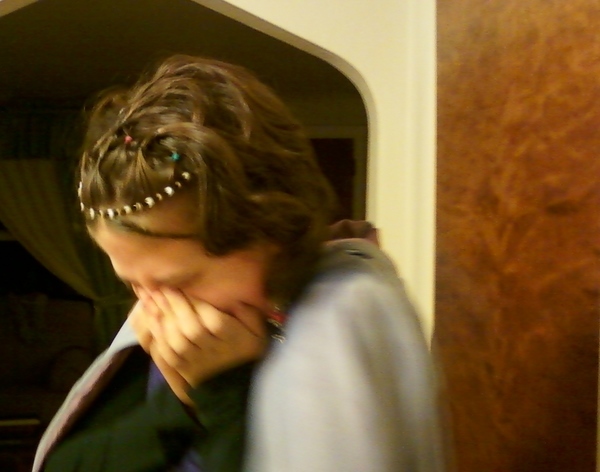 Rachel laughing while dressed up for Halloween. Well, this week her teacher asked her to come babysit regularly so she could have regular lessons, offered to pick her up each week, AND someone donated the next level up of books so she can move on to the next set. Rachel was tickled pink! God is so amazing! We are so very blessed. Lately “water” has been one of the words God keeps bringing to mind. I am encountering water everywhere and today once, again in an unusual way. We had a water bill due which Shamus paid over the phone using our home equity loan, because it needed paid now and we didn’t want to take our bank account down to nothing which might start the bouncing. Now we have been having an odd problem. We have been unable to access a lot of our accounts (bills and bank hough we can pay bills through our bank–totally convoluted and for no obvious reason.) We do believe a lot of it is that we are not supposed to be worrying over money, which is understandable since every time I look at our nearly empty account I get nervous (as does Shamus) and we know that worrying is not God’s way and that He has been providing every step of the way. So, we have pretty much been letting it slide and not trying to force the online accounts to work. The funny part came when she asked about our income. I had to explain that we both now work only on commission and would have plenty to live on if we would just get paid what we are owed but several checks (including one for 9 months worth of work) are not forthcoming so basically we are living on what I make (which comes to about $200 a month give or take) and what people give us. She was amazed (especially after I said we were not doing unemployment, food stamps, etc.) and said something about my wonderful attitude. Of course I couldn’t claim that at all and pointed out that it’s not me, God is the one providing and who am I to complain. She was so excited, said she was going to say similar but had to be careful because of her work situation and then went on to say what an encouragement we were and immediately added us to her prayer list, saying she would pray right away so she didn’t forget. I have to keep reminding myself that those things that make me uncomfortable, the little irritants, inconveniences, and things that I naturally stress over, God plans and uses for good. God has been doing so many things that I am having a hard time keeping up with it all. However, I really feel I need to continue to share so that I can keep track and possibly encourage whoever might be reading as well. This weekend had potential to be a rough one. In fact, it started out pretty rough spiritually speaking. It was so bad that all of us were feeling it– like constantly being slightly embarrassed and uncomfortable. Everything seemed to be off and finally today, after much prayer, discussion to see where things went off, and listening, we figured out the trouble area, confessed, and things have cleared up. The key word that God keeps impressing on us is love. There is more to it but that was where we were going wrong. We were not being loving of some specific people and needed to get back on track. On the other hand, God provided in several amazing ways this weekend in the midst of uncomfortable situations. We were nearly out of enzymes and gas plus several vitamins that we really need due to health issues. The Lord worked it out that during our weekly visit to my grandmother she gave us, on the spur of the moment, enough money to buy some groceries and enzymes. Due to a sale at GNC we were able to get the vitamins, enzymes, and then go next door to Walmart for a few key groceries to fill in the gaps. When we went to get gas the girls decided to use some of the money that Grandma had given them to get a drink (which meant that then Issac wanted to do the same which caused all kinds of confusion.) Their expenditure normally wouldn’t have made a difference on my gas since I usually pump gas first then go pay. However the card reader didn’t work so I had to pay inside (which made me cranky because apparently that store doesn’t due debit card prepay) which meant me standing at the pump in frigid temperatures, twice, trying to get the card to work and running in the store twice instead of just once (did I mention COLD and that I was whiny and the kids couldn’t make up their minds?) And because of all that I got a discount and was able to pay for the gas using the money from a small job I had done that morning before and which had paid immediately. A friend gave us several bags of groceries (with lots of home canned goodies from her freezer and pantry as well as some meat to fill in where we have cut into our own stores, thanks Connie!) which despite some confusion was brought to our house by another friend. There was a bit of a mess involved about which I felt awful. However, God worked it out beautifully so that Rachel ended up getting babysit today in exchange for a piano lesson and most of it ended up being just my discomfort at having everything be a mess and not really be able to make things right when people were going out of their way to help us out. We were the recipient of a package of books from Donita K. Paul (which really deserves it’s own post). In exchange I sent her a painting based on another one that she really liked. It wasn’t till last night that I realized that she had also sent promotional bookmarks with it, one of which she signed! Will take some pictures of the books and bookmarks plus do a bit of a review of the books (which are excellent) when I get a minute. We received a $50 gift certificate for Novica.com (and I get to do a giveaway of another $50 gift certificate to one of you, which is really exciting). As you know I normally don’t do giveaways but I have been so impressed with their items (which are handmade by artisans around the world) and we have been so blessed by them in the past that I would love to share. The really cool thing is that tomorrow is our 14th anniversary and we don’t really have anything with which to celebrate so we ordered a few things that we absolutely love as an anniversary gift to each other. We managed to keep it completely under the $50 including shipping and even had a few dollars left over on it to donate to artisans. As far as the contest goes, I am thinking I will do the contest in the next few days (God willing, I will start it tomorrow). We are literally having a miracle of one sort or another a day and are totally living on faith so I figure I should keep sharing and giving God glory for what He is doing, even in the small things. I know it helps for me to remember how faithful He is being as we go the route He has obviously planned for us (every time we try to do things differently it all falls through so we are being very careful to stay in His will–and right now that seems to mean Shamus writing and me painting and doing some web design work with a little extra work on the side) and hopefully it will encourage others who have found themselves in tight situations. Yesterday’s awesomeness kind of trumped a smaller but just as meaningful little miracle the day before that I had intended to share. On Wednesday Rachel had planned a daddy date that fell through due to Shamus’ migraine. She had wanted him to take her to JC Penney’s to use the gift card she had gotten for her birthday. Needless to say she was very disappointed when he couldn’t take her. I offered to take her instead since I had library books to return and a Michael s gift card to use. After stopping at the library where she ran into a friend she hadn’t seen in a while we went to JC Penney’s. At first she was not too enthusiastic, but we quickly found several things she loved (including the ninja shirt she was wearing in the pictures yesterday). We then headed to Michael’s where what I wanted was seriously on sale. I didn’t need the whole gift card and Rach found a sketch pad she had really wanted on sale and asked me to use the rest of my gift card to get it. It worked out so that I was only over by 26 cents which was perfect since I only had about $1 in change on me. As we left I realized that I had a shirt Rachel had gotten for Christmas in my bag that needed to be returned to Walmart. I had lost the receipt so we weren’t sure how it would work out but thought it worth a go. Rach decided that since I had gotten her the sketch pad she would give me the equivalent from what she got back on the shirt so we could pick up some eggs. We returned the shirt and wandered around the store as Rach looked for things she might be interested in buying. After picking several different things then putting them down we finally found a scarf she liked enough to buy and headed over to get the eggs. It was there in the dairy aisle that Rach spotted the organic pancake batter spray bottle she and her siblings loved and always begged me for (which I nearly always refuse being that it is $4.15 for 13 pancakes!!!) She decided to spend her $4 of Christmas money from the shirt on that (partly because it is her favorite but also because her siblings adore it and always spend their Christmas money on each other and on her so she wanted to do something special for them) and gave me the other $1 (plus the $2 for the eggs) to get something else to fill in the gaps in our pantry. I was attempting to figure out how much exactly we needed as we approached the register so Rach could run and put something back and we wouldn’t inconvenience the cashier. As we got in line (and I was still figuring) a cashier came over from another lane to say she was open so so much for that. I realized just as we got there that we were over by a quarter, and after much searching I realized I didn’t have it and would have to put back a can of green beans. (Now this is just a matter of cents and if you are not in a place where cents matter then it is not a big deal but in this case it was and a can of green beans would be a big help and make Shamus very happy.) So, I was a bit disappointed and let the cashier know before hand that I would probably have to take off a can when we were done. However, as she checked each item out the can of pancake batter came up cheaper and when it was all said and done I still had a nickel left. Like I said, it probably doesn’t seem like a big deal but these are the moments tend to amaze me most since it reminds me how much God cares about the details. Sure it is only a few cents but He cared enough about those few cents and provided. He cares about those small things. He cares that my husband can focus because he can grab some green beans or tuna when he is hungry and I haven’t had a chance to make a meal. He cares that my kids love that pancake batter and that Rachel was trying to do something nice for her siblings. He cares about our wants as much as about our needs and wants to give us good gifts, even if it is just some eggs and a couple cans. He cares about Rachel’s love of all things ninja, that she needed long sleeved shirts and a scarf with cloves attached (which is adorable and keeps her from forgetting gloves). He cares that we have what we need to be free to create. He cares that we have our daily bread whether it is food, clothes, or whatever we need to be the best people we can be. And yesterday Rachel came to me and said, “I am glad we are poor.” When I asked why she explained that we are so much more appreciative of things both big and small when we have little and that when we had the ability to just get what we needed and buy small treats that we didn’t appreciate them nearly as much. That alone is the perfect reminder that God is at work, that He would open the eyes of my 13 year old to this truth, a truth that often grown ups don’t see. I think she is right, though I would really like to be able to pay our bills on time. I know what it is like not to get paid for work done and really want to make things right but even there God is working and will do as He has planned. On Rachel’s birthday I got an email from a friend who said that they had sent money to my paypal account as a special birthday present for Rachel, being that 13 is such a special birthday. 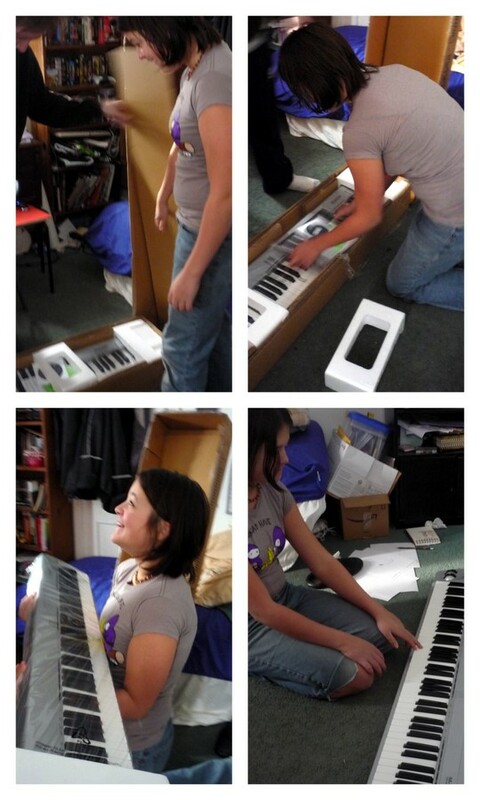 I thought, “Oh, how nice, she will have enough to finish saving for a replacement screen for her Eee PC.” Then I looked in my paypal account and realized that no, she now had enough to buy both the full size midi keyboard she wanted (the “big” thing she was saving for) and the foot pedal for the midi keyboard. After thanking our friends profusely, Shamus and I decided to surprise Rachel by ordering the keyboard instead of giving her the money. As you can see, it was the right thing to do. The keyboard came this morning (which is funny itself because the pedal shipped first and isn’t here yet, and the keyboard itself shipped yesterday. She is in seventh heaven, even though we could only afford a full size that has to be plugged into a computer with the proper program running (full size keyboards with built in speakers and software are EXPENSIVE.) After we got everything working on a spare computer we moved it to the kitchen where her 66 key keyboard was. Now we have a full size midi keyboard plus computer in the kitchen and all three kids are thrilled (especially Rachel, who spent much of the day practicing.) So thank you again to Jethro and Roberta– you made for a very happy girl! Rachel sees the box. She knew a surprise was coming for her birthday but not what or when. Rachel finds out what is inside the box.